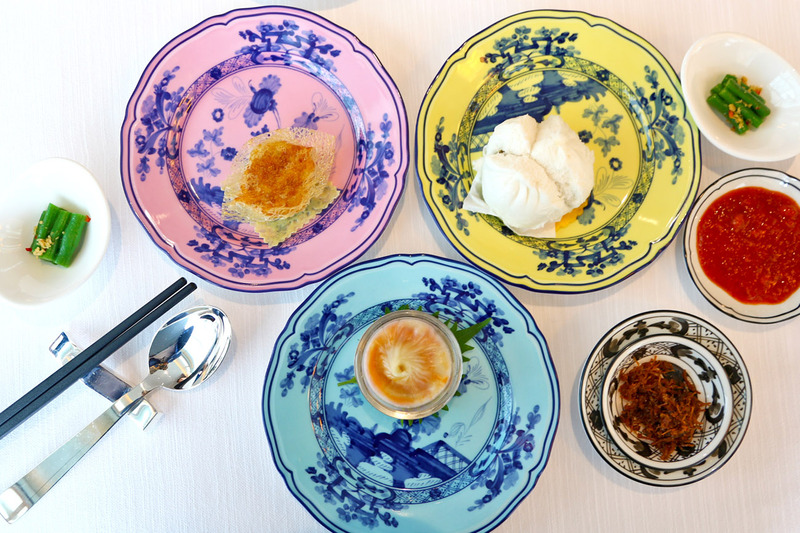 The experience of dining at the new Summer Pavilion is akin to “dining in a garden”. 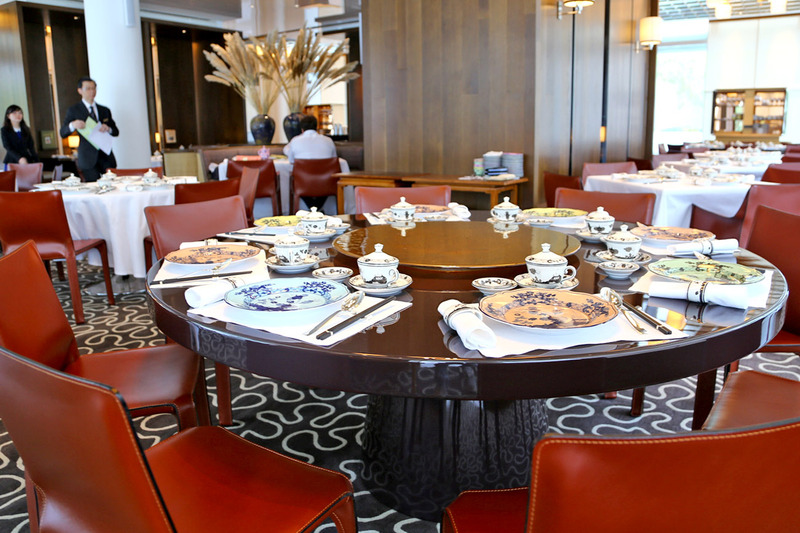 The main dining hall of the revamped Chinese restaurant is surrounded by a modern Chinese garden and a glass pavilion. 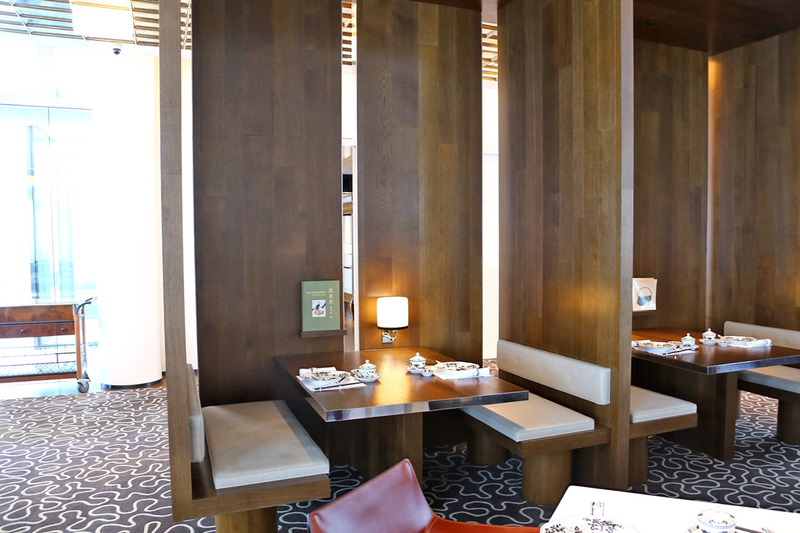 Its interiors elegant, with the extensive use of warm timber matched with maroon-brown chairs. 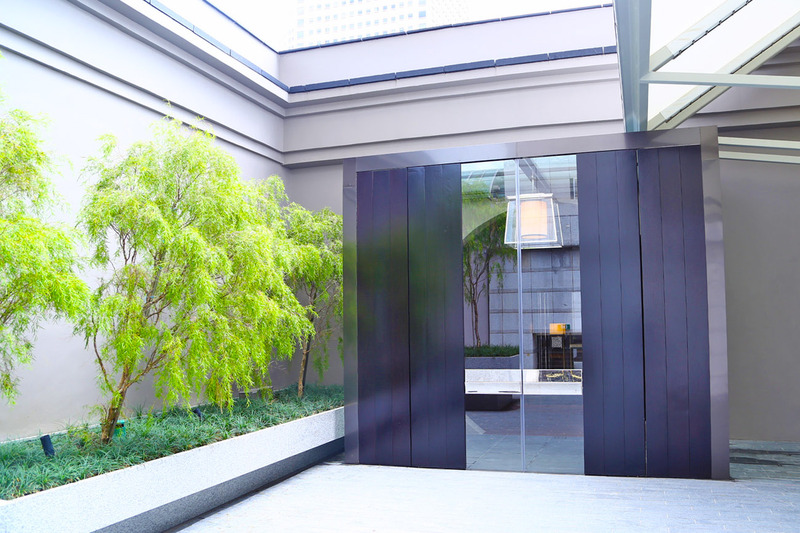 Even the private dining rooms have names inspired by Chinese plants and trees – Pine, Elm, Wisteria, Plum and Bamboo. I can’t remember when I last saw floor to ceiling glass windows and natural light streaming in during the day time at a Chinese restaurant. The refined setting of the new Summer Pavilion is accentuated by the use of colourful Italian fine tableware, and service staff dressed in neat off-white tuxedo-inspired uniforms. 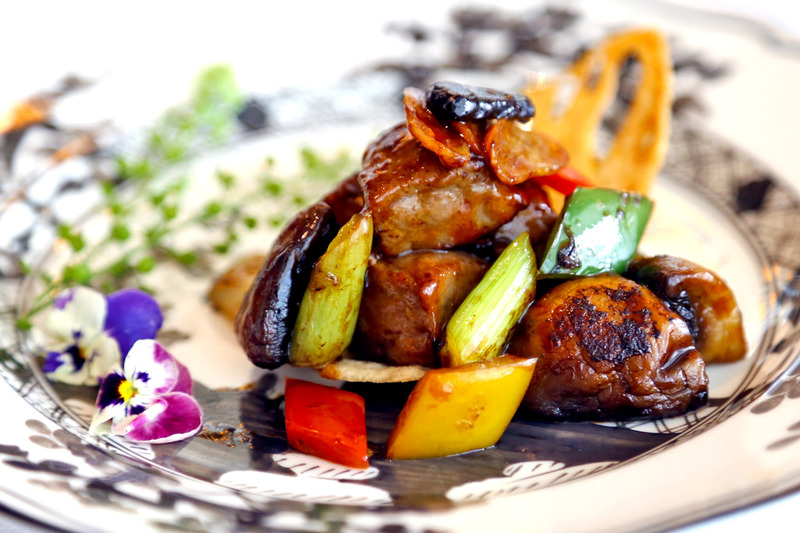 Executive Chinese Chef Cheung Siu Kong helms the kitchen and aims to excite palates with a repertoire of exquisite, contemporary Cantonese cuisine. 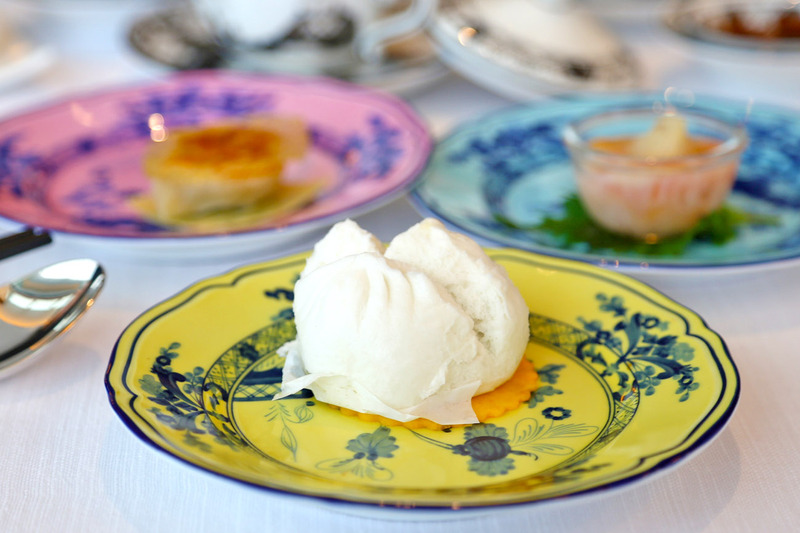 A selection of dim sum items are also available during lunch. These dim sum delights range from Steamed Prawn and Bamboo Shoot Dumplings ($6 for 4 pieces), Steamed Pork, Prawn and Mushroom Dumplings ($6 for 4 pieces), Deep-fried Seafood Roll ($6 for 3 pieces), to more exquisite (and luxurious) Steamed Lobster, Crabmeat, Chicken and Ginger Dumpling ($9.80 per piece). 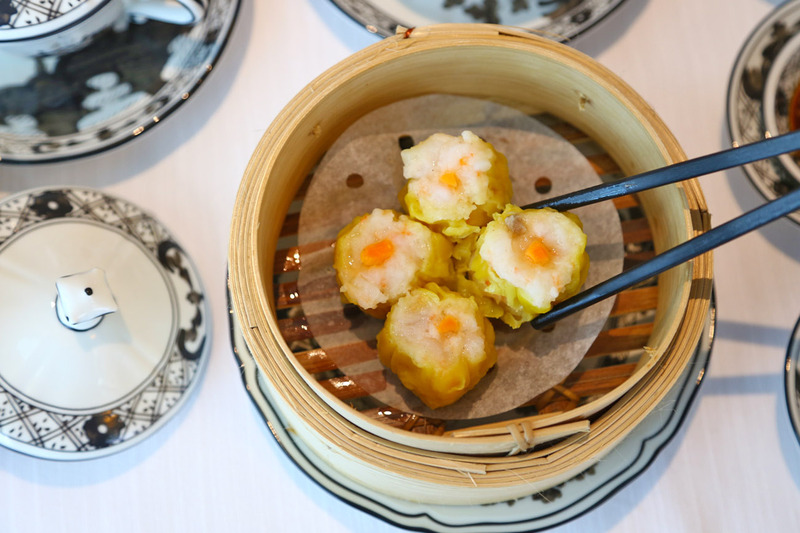 I did notice that the dim sum in general, were daintier than most restaurants. The Steamed Barbecued Pork Bun aka Char Siew Bao ($4.80 for 3 pieces) is one of the most exceptional ones I’ve had here in Singapore. 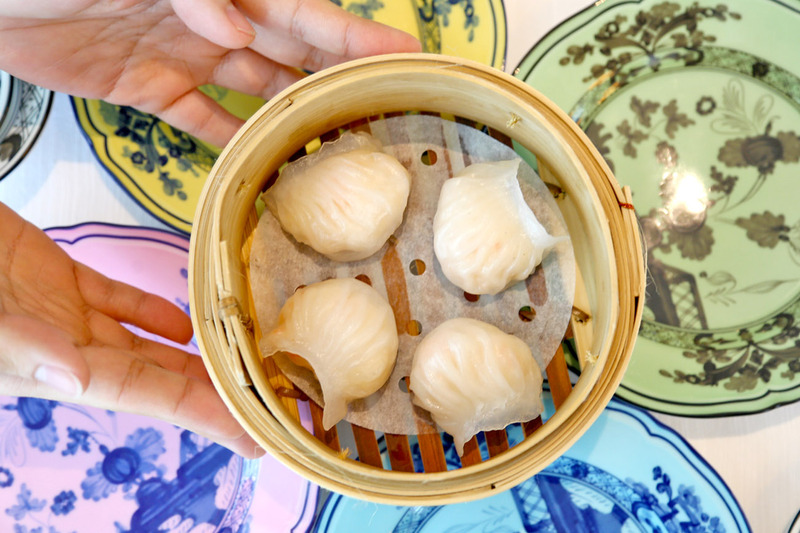 While looking deceptively simple, you can feel the difference by holding it in your hands – the char siew bao is fluffy like a plush cushion, small but packs a punch. The inner filling which includes onions and preserved vegetables, provides the perfect combination of sweet and savoury. 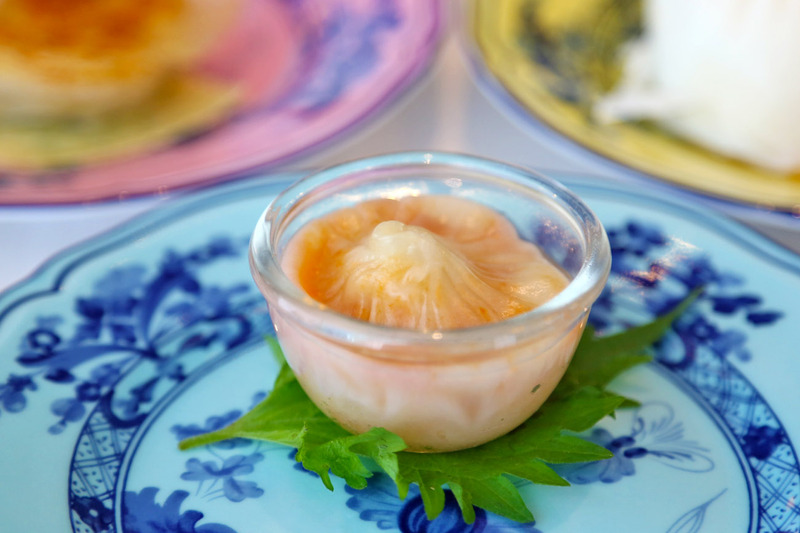 The Xiao Long Bao ($9.80 per piece) is on the slightly pricier side, but it is filled with quality ingredients including lobster, crabmeat and chicken, enhanced by a tasty lobster broth. I would say that soups are Chef Cheung’s forte. 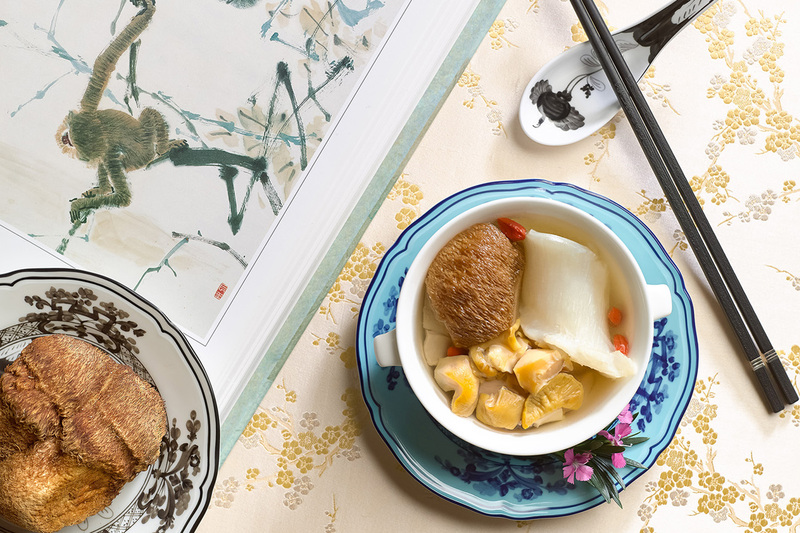 After all, the Cantonese have always been known for their expertise in cooking double-boiled soups. The last time I had a pampering dish like this was in the form of a sweet dessert. 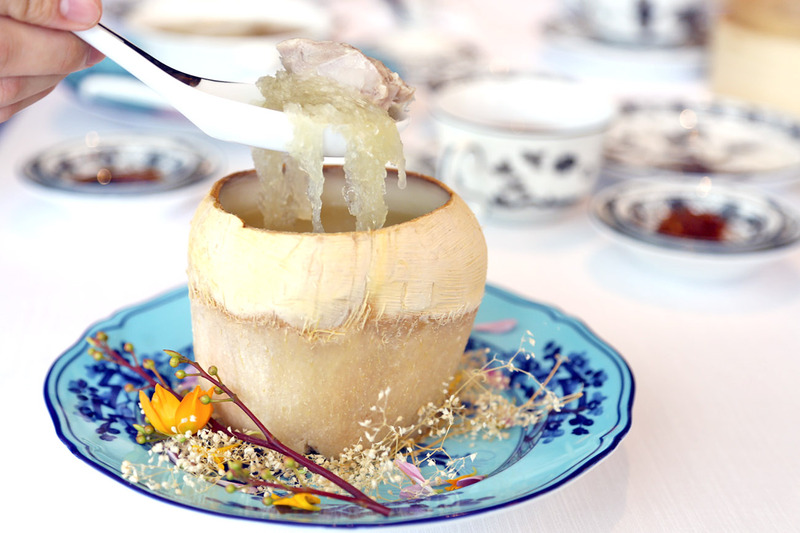 Summer Pavilion’s Double-Boiled Superior Bird’s Nest Served In Whole Coconut ($98 per person) is quite the opposite – savoury as it is boiled with chicken, aromatic to the whiff, nourishing to taste, with a refreshingly sweet coconut aftertaste. This Poached Rice and Lobster Meat ($20 per person) is one dish I will recommend. It has been a long time since I last tasted a dish similar to this, since my trip to Hong Kong. 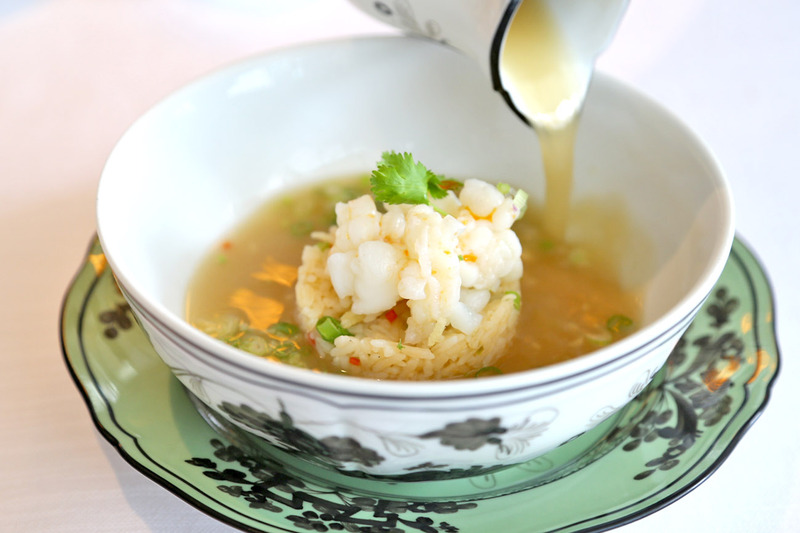 This delicate dish contains rice of dual textures (part crispy), topped with chunky lobster meat, and superior stock poured into the bowl upon serving. A comforting dish, the play on the different textures of rice is perfectly balanced against the richness of the seafood and the clear, light stock. The Sautéed Japanese Wagyu Beef, Wild Mushroom, and Organic Black Garlic ($30 per person) was acceptable for its price, but I wasn’t particularly blown away. Maybe because the seasoning overwhelmed the natural taste of the wagyu. 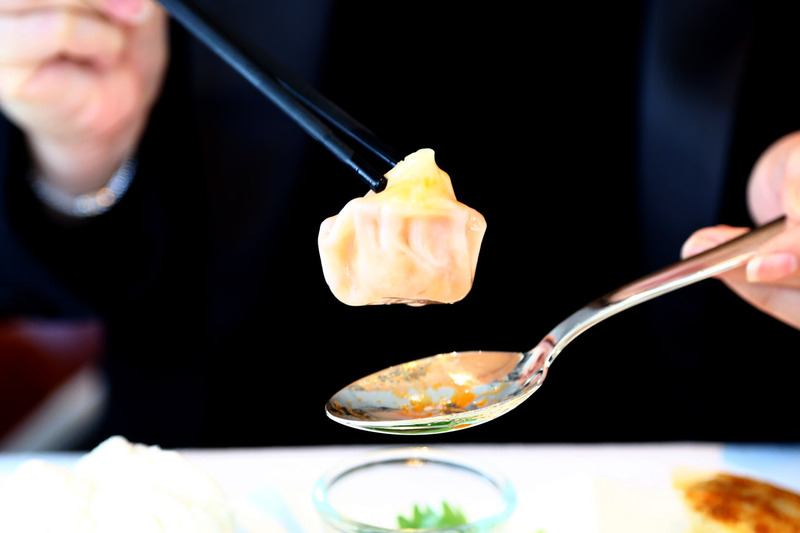 Overall, I was impressed with Summer Pavilion on many levels – its lush décor, the professional service rendered, attention to detail, and quality of Chef Cheung’s dishes. My personal opinion is that it only needs a few stellar dishes to propel it to even greater heights. And I won’t be surprised if a Michelin star comes knocking in 2016. 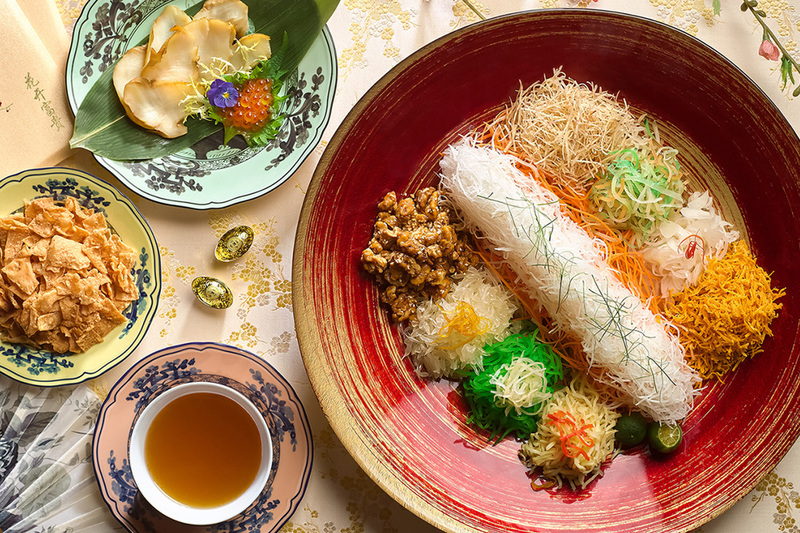 To usher in the Year of the Monkey, Summer Pavilion has introduced a signature Chilled Sea Whelk and Salmon Caviar Yu Sheng 三文鱼子冻响螺捞起. The sea whelk is braised in a specially concocted abalone sauce and the salmon caviar adds a burst of flavour to the crunchiness of the yusheng. 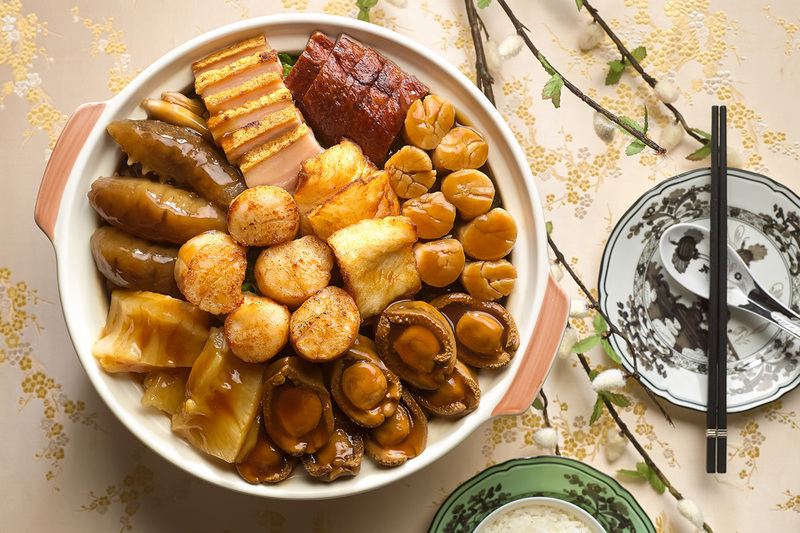 Its Pen Cai contain 12 luxurious ingredients such as abalone, fish maw, prickly sea cucumber, sea perch, roasted pork, roasted duck, goose webs, Chinese mushrooms, conpoy, black moss, scallops and seasonal vegetables. 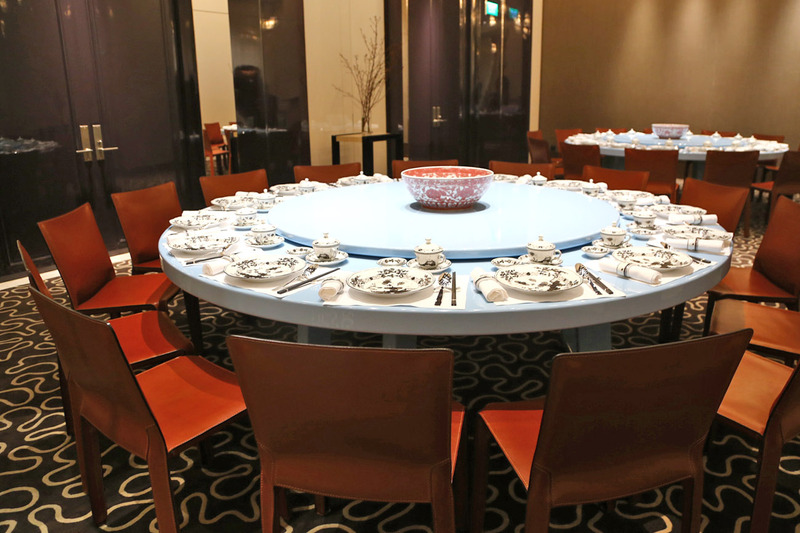 Available for dine-in and takeaway, each Pen Cai is priced at $380 for a small portion (serves four to six persons) and $760 for a large portion (serves eight to ten persons). An advance order of three days is required. Five to eight-course set lunch and dinner menus are available, priced from $68 per person. 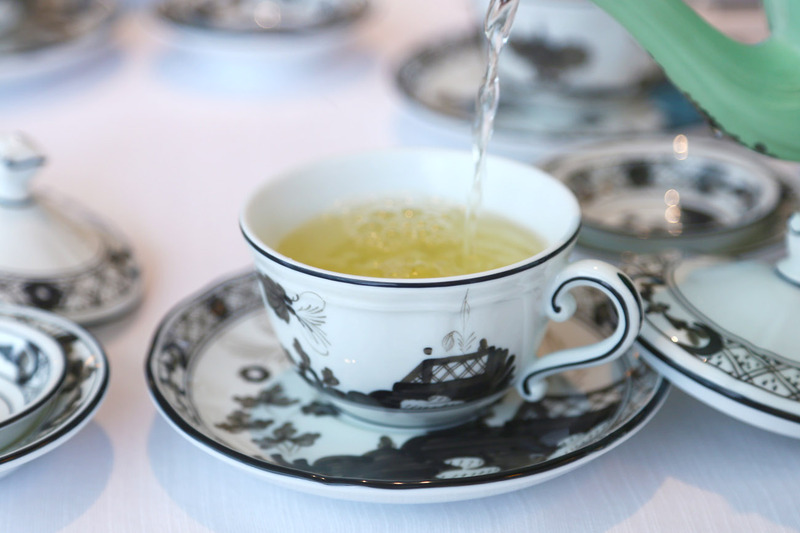 Tea Salon Daily: 12 p.m. to 10 p.m.
10 types of specialty teas such as Lychee Oolong and Momo-in-Black by Tea Bone Zen Mind, and other artisanal tea accoutrements are available for purchase to complement your meal in Summer Pavilion, or for takeaway. All prices listed above are subject to 10 percent service charge and prevailing government taxes. 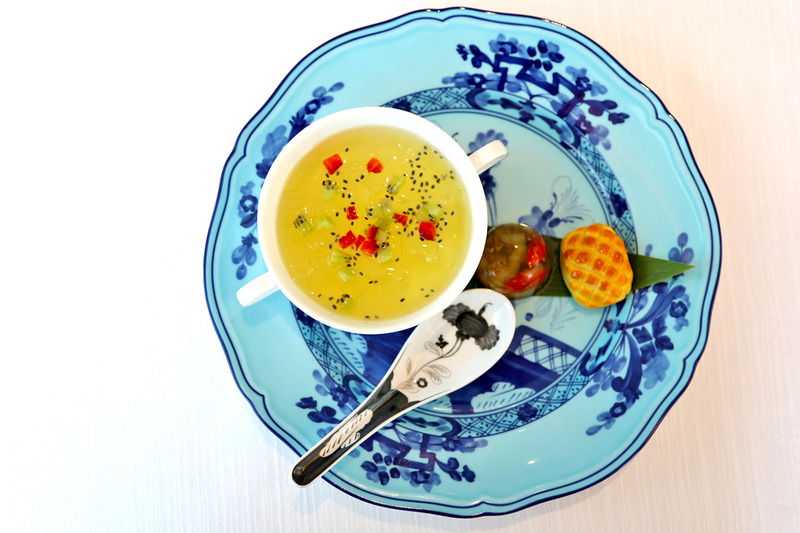 Enjoy 10% off your total bill at Summer Pavilion (excluding set menus) from now until 24 January 2016. (Not applicable on 24 & 25 Dec, 31 Dec and 1 Jan). 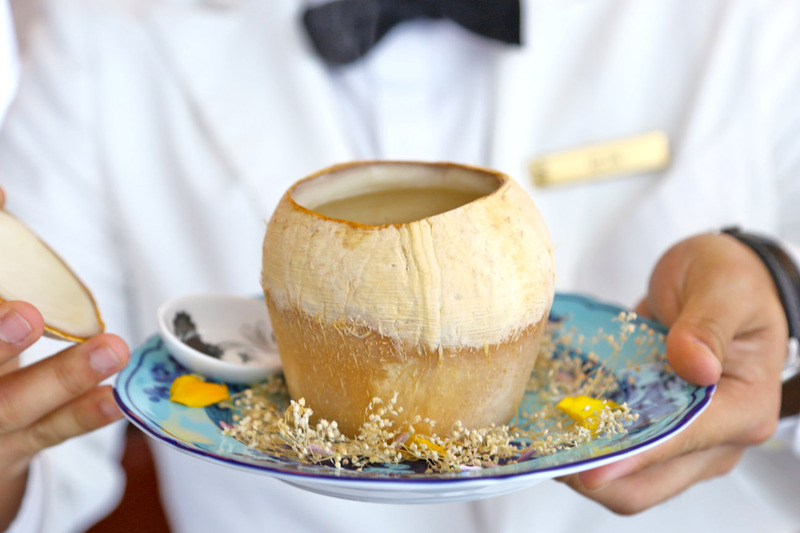 ← 15 Must Try Truffle Dishes In Singapore – Truffle Waffles, Lobster Roll, Wanton Mee, Chawanmushi, Mac & Cheese!